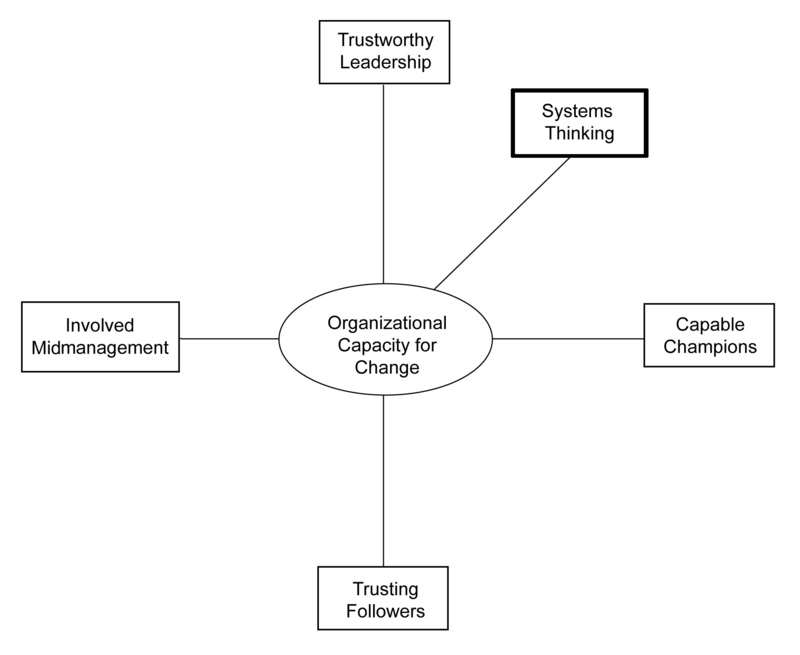 This is “OCC Dimension 5: Systems Thinking”, chapter 7 from the book Beginning Organizational Change (v. 1.0). For details on it (including licensing), click here. A system must have an aim. Without an aim, there is no system. A system must be managed. The secret is cooperation between components toward the aim of the organization. W. Edwards Deming, the guru of total quality management, defines a systemA network of interdependent components that work together to accomplish a common goal. as “a network of interdependent components that work together to try to accomplish a common aim.”Deming (1986), p. 32. A pile of sand is technically not a system since the removal of a single component (i.e., a grain of sand) does not change the functioning of the collectivity (i.e., the pile). Furthermore, there is no “aim” designed into or emanating from the pile. In contrast, a car is a system that comprises thousands of parts that all work together to provide transportation to a driver. If you remove the gasoline tank, then the car fails to perform its aim properly. In this case, the aim is designed into the car by the automobile design team, so the car is a mechanical, not a living, system. Living systems are the most complex forms of systems. What makes them unique is that they interact with their environment and are self-organizing. As a result, the aim is not designed in but constantly evolving over time. Living systems can be something as simple as a cell, to something as complex as the European Union. Therefore, one of the ways of determining whether a collectivity is a system or not is (a) the interacting parts possess a central aim or purpose and (b) the removal of a component changes the functioning of the overall system.Miller (1978). Systems thinking builds on our understanding of natural and man-made systems. It emphasizes that we need to understand how the whole affects its parts and how the parts affect the whole. This is different from traditional thinking, which assumes that the parts are independent of the whole. It is a set of techniques and an overarching mind-set that “problems” can best be solved by considering the component’s relationship to the overall system and its environment. This type of thinking is revolutionizing many fields of study. For example, we now know that the pain that you have in your back may be caused by one leg being longer than the other so that the skeletal subsystem is skewed. In other words, close examination of a person’s back will reveal the symptoms (i.e., back pain), but not the causes (i.e., leg length differences). In traditional thinking, diagnosis of back pain focuses exclusively on the pained area of the body. Systems thinkers tell us that there are two types of systems—closed and open systems. Closed systemsSystems that are relatively independent of their environment. function as systems relatively independent of their environment; open systemsSystems that are constantly exchanging material, energy, and information with their environment. are constantly exchanging material, energy, and information with their environment. An example of a closed system is the circulatory system of a fish versus mollusks. In fish (and other vertebrates), the blood circulates within vessels of different lengths and wall thicknesses, so its circulatory system is relatively closed to the rest of its body cavities. In mollusks (and most invertebrates), there are no vessels and the blood circulates within the tissues of the entire body cavity. The key notion for our purposes is the fact that system openness is a relative state, not an absolute state. Sometimes the components or elements of a system function as subsystems within a larger system. A subsystemA collection of components or elements within a larger system that has a smaller aim. is a collection of components or elements with a smaller aim within the larger system. Hence, there are various levels of systems that operate interdependently. A prime example here would be the financial subsystem’s impact on and relationship with the larger national economic system. Systems thinking is revolutionizing the organizational sciences, just as it is challenging all the other sciences. If we consider the organization to be a living system, then organizational problems and opportunities are viewed in an entirely new way. For example, a high-performing individual might be creating dysfunction within his or her work group. Similarly, an award-winning department might be the cause of organizational decline. And a financially successful organization could be polluting its natural environment. Interestingly, systems thinking can lead to principles that transcend a particular area of study. For example, the Japanese often study natural systems (i.e., a river) to guide them in the design and improvement of interorganizational systems (i.e., a supply chain). Similarly, Margaret Wheatley has used systems insights from the study of quantum mechanics to better understand the proper functioning of organizational systems.Wheatley (2006). Systems thinking requires us to consider the subsystems and components within an organization, and the organization as a subsystem within its larger environment. Organizations vary in terms of their levels of openness to the environment, and systems thinking suggests that a balance must be struck between maintaining some boundaries with the environment and assuring that those boundaries are somewhat porous. A classic systems problem is that the organization is not listening enough to its current customers (it is too closed), or that it is listening too much to its current customers, or what Clayton Christensen calls the innovator’s dilemma.Christensen (1997). Systems thinking also requires us to consider the aim of the system and to what degree the members of the organization, or larger society, align with the overarching aim. Chris Argyris eloquently describes how individuals often have both espoused aims and actual aims; and how the key to individual health and productivity involves minimizing the distance between what is espoused and what is actual.Argyris (1993). The stakeholder versus stockholder perspective of organizations also deals with the aim of the organizational system. For some managers and theorists, maximizing shareholder wealth is the sole purpose of the corporation, and by doing so the overall economic system, of which the organization is a part, benefits. However, other managers and theorists suggest that there are multiple social actors inside and outside the organization with a “stake” in the functioning of the organization, and that no one stakeholder is more important than any other. Systems thinking enable managers to sort out this difficult, value-laden issue. Peter Senge was a pioneer in helping us to apply systems thinking to organizational change. He emphasized the central role of organizational learning, and created frameworks and tools for diagnosing organizational dysfunction and enhancing organizational functioning. In particular, he emphasized some of the organizational learning disabilities, or delusions, that must be acknowledged if the organization wants to change and survive. mental models are deeply ingrained assumptions, generalizations, or even picture or images that influence how we understand the world and how we take action. Very often, we are not consciously aware of our mental models or the effects that they have on our behavior.Senge (1990), p. 8. Therefore, change-capable organizations are conscious of their shared mental models, and are adept in revising those mental models when they no longer work properly. The boiled frog delusion is a commonly told story, but rarely do living systems learn from its message. If you place a frog in a pot of boiling water, it will immediately hop out. But if you carefully place the frog in a pot containing room-temperature water, and gradually raise the temperature of the water, the frog will not notice the temperature increase and will stay in the water even though he is free to jump out. The reason for this is that the frog’s internal mechanism for survival is geared to deal with sudden changes to his environment, not gradual ones. The same applies to our organizations.Senge (1990), p. 23. In many ways, our organizations change dramatically and well when the environment shifts in radical ways. Think of how individuals and organizations in New York City demonstrated magnificent performance in the advent of the 9/11 terrorist attack, which was violent and sudden and dramatic. However, creeping problems like slowly eroding market share, insidious environmental pollution, steady quality declines, and turnover by some of the key employees of an organization are often not noticed. The environment is turning up the heat slowly but surely on many of our organizations, but it is happening so gradually that we do not notice or take action to correct this trend. However, what happens when there is not a direct effect of our actions on organizational outcomes? Many individuals recognize that they can do their best, but the project gets canceled for other reasons. And some sales units pursue customers aggressively and sales still fall. And some organizations hit their earnings guidance, but the stock price still continues to fall. When learning from direct experience doesn’t work, Senge suggests that we need to think more systemically about cause and effect. He states, “Herein lies the core learning dilemma that confronts organizations: We learn best from experience but we never directly experience the consequences of many of our most important decisions.”Senge (1990), p. 25. The systems perspective tells us that we must look beyond individual mistakes or bad luck to understand important problems…We must look into the underlying structures which shape individual actions and create the conditions where types of events become likely.Senge (1990), pp. 42–43.